Just released today for PRE-ORDER: https://shapertools.com/ Is the Shaper "Origin". 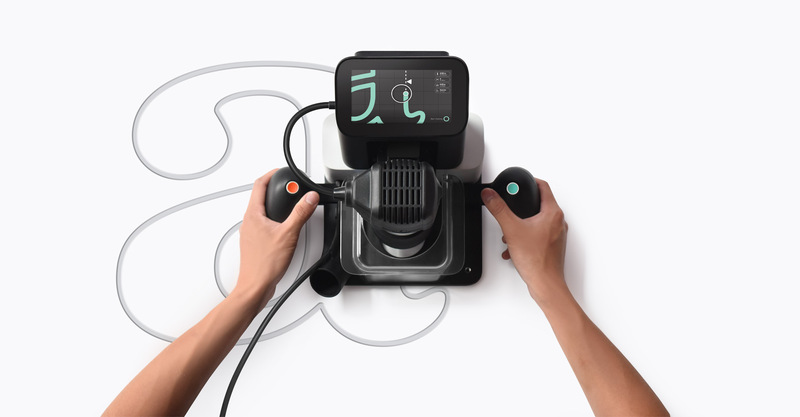 Its essentially a handheld CNC machine that you can use almost anywhere on almost any surface and the computer compensates for less than accurate cuts to give you perfect/near perfect cut. Link 1 Make Magazine's Coverage of the release. Link 2 Applied Science's Coverage of a beta prototype in use. This is a very exciting technology, and was giddy until the release announcement. I hate to say it, but with the "release", I'm disappointed overall. The announcement today was/is essentially nothing more than a self run kickstarter where you can "pre-order a unit". A unit NOT in production. So there are all the caveats of dealing with a kickstarter project, and more so that its NOT actually ON kickstarter. When speaking to most of the people around the maker booth at the last two bay area maker faires, these individuals seemed to indicate, along with other marketing emails recently sent, that they were close to production. When I hear that kind of talk, to me that indicates they have everything set up and will start producing units in a few months, and depending on when you preorder you should be seeing production units out in the wild. So with their emails of an exciting announcement, I was expecting a Oct-Dec delivery. What we got was a we're thinking of Sept 2017 time frame. A Sept 2017 "expected" delivery! Thats a YEAR away! Of course which they charge your credit card as soon as you preorder. So you've given them a interest free (for them) infusion of cash, while you pay that credit card off. Which, just like kickstarter if something were to go wrong, oh like someone buying a house with the starter monies, and then they try to "fix" whatever goes wrong, but ultimately can't deliver anything except for an apology email about all of their good intentions, you'll be left holding your empty money bag. This is because most credit cards have limits on the length of time you can apply for a dispute/refund and a year is usually MONTHS too long to dispute anything. Sure the company can say they offer a refund up until it ships, but if it never ships, and they don't have the money to refund anyone, you'll end up with ZERO monies, and ZERO product. Another issue I was disappointed on was with the price. Shaper indicated over and over, in person and in emails that the target price would be around $1500. Then they said well for early birds/pre-orders, etc. Then the actual announcement and they list them for $1499. That's kind of a douchey move if you ask me $1 "under" so they can be "technically right about the $1500 statement" for early birds. But wait if you're one of the early early EARLY birds you can get it for $1299! With that said there are only a "select few", which screams "you're part of the open beta test! ", that can get this price. Retail is going to be $2099. WTF? I talk about that more below. In addition another disappointment, is they're also using a "custom" spindle but all of their "demo's" have been with dewalt routers, which appear to be the $199 (or maybe the cheaper versions), and if they've switched out the spindles with a "mass produced silent and cheaper version", like most of those cnc kits out there, most of those users end up switching out to the said dewalt router, or similar, because of speed, accuracy, and durability. This last bit is just speculation, but from the video it appears the new spindle might be smaller, and possibly you wouldn't be able to do a swap out??? If so that means you have to rely on them for swap out / repairs. Which isn't good. Isn't good at all! Lastly, there is that price again $2099 for retail? WTF. This appears to be nothing more than a compact computer, hopefully not just a raspberry pi, or similar, which might justify the price a bit more, and a inexpensive router. So why is thing even over $1000 bucks? The items that make up the unit are likely not more than $500 bucks. I would expect a price of $799, $899, with a option to go with a more powerful router for $1000 even or better still a $699 version where you bring your own router. Also $10-15 for a roll of the tape is also pricey, which they say you can only get through them, though Applied Science's video of an early prototype where he's cutting metal i think he indicated you could print out the registration marks. Which Shaper should allow, the printing of the registration marks rather than rely on the stupid tape route. Who knows maybe the maker community, like the 3d printer, can come up with a cheaper/better solution for the masses.